We could hear the familiar, annoying whine of the mosquitos as we were heading up the road above the sno-park. They were making the same noise as those we heard while hiking, except with much greater volume. "That's the biggest mosquito I've ever seen", one group member commented. Indeed, these mosquitos were labeled with "Kawasaki" and Ski-Doo" and they packed some horsepower. They were not the kind that could be outrun by snowshoers or even discouraged by cold or clothing. 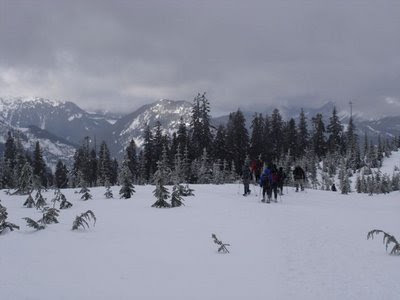 Worse yet, they seemed to mock us; while we, a group of 12 strong Mountaineers were breaking trail on snowshoes and gaining 3,000' from the Price Creek Sno-Park to Keechelus Ridge, they were zipping around aimlessly, without breaking a sweat. Then, climbing higher, the roar of an elephant could be heard. This was getting exciting! The African safari experience right here in a Washington winter. We continued on past the radio tower to the true ridge summit at 5,151' and the elephants bellowed on, infrequent but very much audible. We were serenaded while eating lunch while the temperature was an astonishing 20 degrees,quite unlike an elephant's native climate. While descending back down from the ridge, enjoying the freshly fallen snow so that we could feel like we were actually snowshoeing, we stayed in audible range of both mosquitos and elephants for quite awhile, until they went off to their drinking holes and we were left in silence. 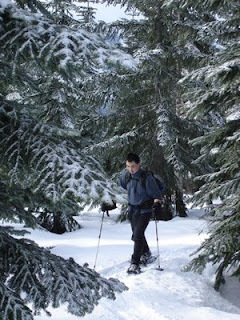 Eventually, the sound of snowshoes against hard snow came back into the equation as we made our usual winter Mountaineer sounds.